Late last month, Hollie Breaux Mallet was looking over security camera footage at home when she noticed a young boy sneaking into her garage. 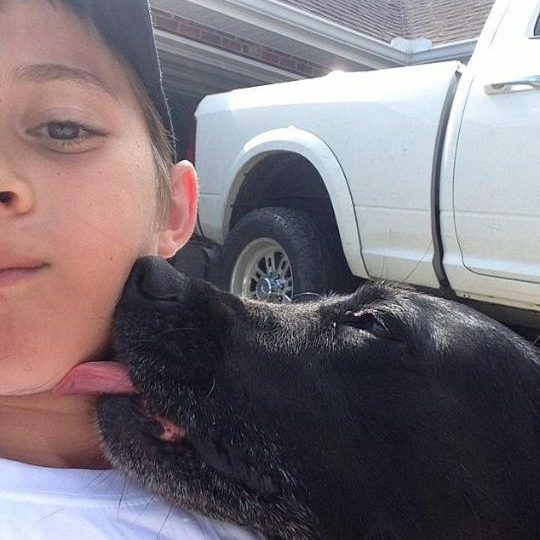 Even though he was trespassing, he wasn’t there to steal or rifle through his neighbor’s belongings – he simply wanted to give Mallet’s dog, Duchess, a big hug. In the video, the boy can be seen riding his bike past the house before jumping off, running into the garage to hug and cuddle Duchess, and then running back out and heading home. Touched by this sweet gesture, Mallet decided to try to track the boy down, to tell him he didn’t have to sneak in. Within 24 hours, the boy’s mother, Ginger Clement Breaux, got in touch: “Ok so…Yes, this is Josh. And I’m torn with my heart melting that he adores dogs so much AND with feeling upset that his little booty shouldn’t be going on someone’s property without permission or without me knowing.” She added that the 9-year-old talks about Duchess “all the time”, so Mallet invited Josh to continue to come and play.